DeWitt Clinton is only one of the many schools slated for “early engagement” potentially leading to closure – we call on all supporters of public education to come out to support our neighborhood public schools and stop Bloomberg’s school closure campaign. Please send reports from this and other hearings (like the well-attended hearing for Boys and Girls HS in Brooklyn Tuesday) to more@morecaucusnyc.org. The NYC Dept. of Education has included DeWitt Clinton HS in the Bronx on its recently released list of “failing schools”, which means that it may shut down Clinton – a school that is more than 100 years old – within the next year. Clinton is one of a few large comprehensive high schools remaining in NYC; the others having been undermined then closed by the DOE. This policy of closing schools rather than helping them is part of the effort of “reformers” to privatize public education. There has been a systematic sabotage of large high schools by the Bloomberg administration. After more than a decade in office there are more and more schools that, based on the Department of Education’s questionable “Progress Reports,” are slated to close. We believe that schools do not fail, which is what education “reformers” claim; rather, it is policies that fail. In 1999, U.S. News and World Report listed Clinton as one of the 96 outstanding schools in the country. During the Bloomberg regime, the school has declined to a point where we now have received an “F” on the city’s dubious report card. The story of our decline, like that of dozens of high schools in NYC, is a tale of bad policies, lack of support, and statistical calculations that favor newly created small schools over large comprehensive ones. Over the past few years, we have watched as the city funneled high needs students into specific schools, and then closed those schools based on declining scores. DeWitt Clinton is one of those schools which have been flooded with students who are known to be the most challenging to educate. Currently DeWitt Clinton has 748 students who are English Language Learners (ELLs), which is 19% of the total school population, and 556 Special Education students which accounts for 13% of the school. (Many of the Bloomberg-created small schools have 400-500 students in the entire school.) It should come as no surprise, then, that the number of Clinton students who graduate in four years is below the city average – the population of incoming students is simply a different caliber and requires extra services than those that we are being measured against. (However, the number of students who graduate in six years is 71.5%, which is higher than the city-wide average.) To those critics that say DeWitt Clinton is just a dropout factory, we say in response that it is the city’s policies that have created this dropout factory. Other factors that are relevant include the fact that our per-pupil spending is lower than city-wide norms; the number of students whose families are considered poor is higher than the city average; and the number of students who have low scores, poor attendance and/or discipline issues in middle school is quite high. For example, out of a current incoming class of 950 students, more than 100 were considered long term absents (LTAs) in 8th grade and more than 100 failed a majority of their 8thgrade classes. It is the current administration’s practice of closing schools based on assessments that do not take certain factors into account that are too heavy-handed and ignore the reality of the lives and environment of our students. Indeed, there were a number of schools on the potential closing list from last year which have improved their performance and are no longer being considered for closure. It would seem to us that this measure of closing our school – which is so rich with tradition and history – is drastic, when it has been proven that additional time, resources and investment can result in a school’s rebound and improvement. The Mayor has chosen his toughest battles for his final political year. With the potential closings of more high schools, we are witnessing Bloomberg touting his agenda of opening small schools (which have not been shown to be any more effective than the large schools) in one last ditch attempt to claim that his educational policies are successful, despite the concerns of the community, current students and education professionals. Despite the factors described above, we are proud of our significant achievements. 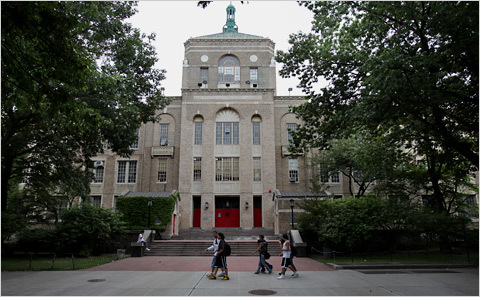 DeWitt Clinton offers more than a dozen Advanced Placement classes, has a large number of highly engaging student clubs (which faculty supervise without pay because of budget shortages), and approximately 30 athletic teams. The number of students who attend public colleges and who earn at least 30 credits in their first two years is 61%, which virtually matches the NY State average of 61.5%. Our students attend some of the best universities in the country – the honors program at DeWitt Clinton High School is still so highly regarded that college recruiters make it a point to recruit our students because of the quality education they have received. These are the same students that continually demonstrate the fine teaching being practiced at Clinton, through AP scores that far exceed city and national averages. Bronx middle schools continue to send their best and brightest to Clinton because we serve these gifted minority students. None of this is factored into the school report cards, but it is widely known in the Bronx education community. There are simply too many good things happening here at Clinton for the city’s “solution” to be closure. Many students do thrive in small schools; however, it is the large schools that offer a wide array of course offerings, extra-curricular activities and traditions. It would be a shame to close the last comprehensive high school on the west side of the Bronx – and one of only a handful left in NYC. We believe strongly that the tradition of our school extends beyond the current student population, teachers and administration – the institution of DeWitt Clinton is 115 years old, and we owe it to future generations to keep this rich tradition alive. The list of our notable alumni is 38 pages long and includes such luminaries as James Baldwin, Richard Avedon, Ralph Lauren, Paddy Chayefsky, Countee Cullen, Avery Fisher, Irving Howe, Robert Klein, Stan Lee, Neil Simon, Burt Lancaster, Tracy Morgan, Charles Rangel, and many others. One response to Stop School Closings! My father, though not famous, graduated from Clinton many years ago. He and others got a good education there. It has a storied past and should be able to have a future. Save DeWitt Clinton!